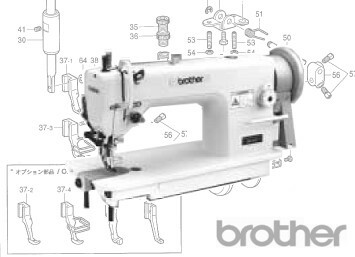 BROTHER DB2-B727 Top & Bottom Feed Walking Foot Lockstitch Machine Model DB2-B727 is a Top & Bottom Feed Lockstitch (without Needle Feed) used for Sewing Plastics,Leather and Bulky Work where the Extra Feed helps prevent 'Ply Shifting' and Sticking. Model DB2-B745 is basically the Same machine but having Lower Feed Only. Both Machines are Fitted with Large Capacity Rotary Hook Assemblies and offer Long Stitch Capability (upto7mm). This just a selection of our most popular parts. If the part you need is not shown, or you are unsure what you need, check out the PARTS BOOK below or please call us and one of our Expert Engineers will be happy to help out.